Eric is an ordinary boy who loves football, and hates tests. 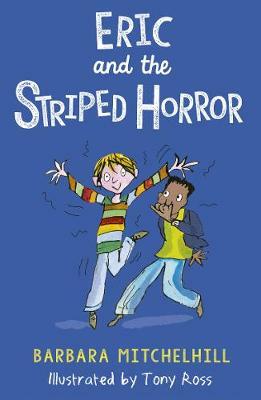 Then his Auntie Rose sends him a very strange present from her travels in South America: an ugly, stinky, stripy jumper with magical powers. Eric finds the jumper really does have a miraculous effect on his brain power ... read full description below. Barbara Mitchelhill (Author) Barbara Mitchelhill was born in Rochdale and trained as a teacher. While she was teaching, she began writing for BBC children's TV and went on to write for educational publishers, before writing novels for children. She makes school visits all over the country, and enjoys appearing at literary festivals and talking to teachers and librarians, some as far away as the Caribbean. Her hobbies include reading, theatre, music, gardening and walking her border terrier, Ella. She lives in Staffordshire and has two grown-up daughters and four grandchildren.Tony Ross (Illustrator) Tony Ross has been illustrating books for over 40 years, and has been published all over the world. He is perhaps best known for his much-loved Little Princess series, which has been adapted for TV and is currently showing on Channel 5s Milkshake, and for his collaboration on David Walliams? best-selling children?s books. Tony?s books have been shortlisted for the The Laugh Out Loud Book Awards (Slug Needs a Hug) and the Kate Greenaway (Dr Xargle's Book of Earth Tiggers), and Tadpole?s Promise won the Silver Medal Smarties Prize. He has been named as the best-selling illustrator in the UK for three years in a row, and he is the UK?s libraries' most-borrwed illustrator. He lives in Rutland.